File photo of Air Bus A319 of Drukair. Landlocked Himalayan Kingdom Bhutan, which has been regularly using Assam roads for its surface communications, has now “repaid” the people of Assam with dividends by directly linking Guwahati with Singapore.The inaugural Guwahati-Singapore Drukair flight took-off at8.35 amon Saturday from Lokapriya Gopinath Bardoloi International Airport in Guwahati. The flight set the beginning of a new era of international air connectivity for the people of northeast India. So far, the northeast states, because of its geographical isolation, remained landlocked, and there was hardly any international air connectivity. It was Drukair , which started a bi-weekly Guwahati-Bangkok flight in 2015. “We are very happy that a friendly neighbour like Bhutan could understand the need of the people of Assam and introduced the two direct international flights to Bangkok and Singapore,” Ranjita Das, a young entrepreneur toldNortheast Nowon Saturday. Without thinking about the viability of the Guwahati-Singapore sector, Drukair introduced the flighton Saturday, and is viewed as Thimphu’s “goodwill gesture” to mark 50 years of diplomatic relations between Bhutan and India. 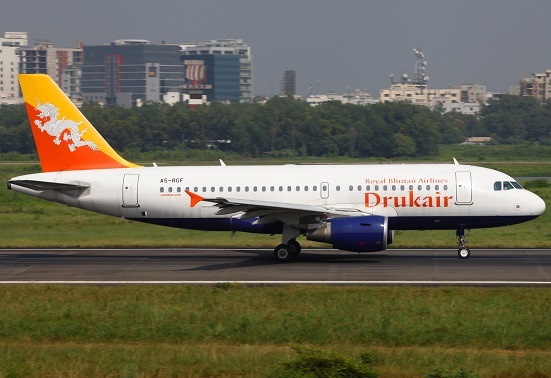 The Drukair introduced a 118-seater Airbus 319 in the Guwahati-Singapore route. “We have a lot of good things to learn from Bhutan. It is the most beautiful and well managed country in entire South Asia,” Amlan Dutta, a young technocrat, who recently availed the Guwahati-Bangkok flight, said, adding that the in-flight services in Drukair is of Western European standards. Common people in Assam are euphoric because now they can embark on a holiday to the Southeast Asia without any hassle. “It is cumbersome to fly to Kolkata first, and then catch a flight to Bangkok or to Singapore. Thanks to Drukair. It has made our travel faster and cheaper,” Arijit Das, a software engineer who is now based in Singapore, said. Moreover, Drukair has announced to offer huge discounts in Guwahati-Singapore sector till December 2018. Assam Chief Minister Sarbananda Sonowalon Thursdayinaugurated the Guwahati-Singapore Drukair flight at a function in Guwahati, and said diplomatic relations between India and Bhutan would receive a major boost with the launch of new international flight. He termed the Drukair initiative as “historic” and thanked the Royal Government of Bhutan.